Articulate Online is a powerful yet intuitive way to track and report how your audience interacts with e-learning content. It’s a great alternative to a traditional learning management system, because it provides just the right features without the cost and complications that often accompany other reporting systems. See this tutorials on this page for details. If you have questions that aren’t answered here, no worries—you can always tap into the superpowers of the Articulate community by asking your question in the forums. 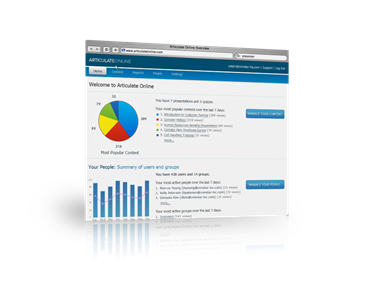 You’ll find thousands of other Articulate users and staff there who can help.